How will the customer persona guide and template help me and my business? We've been big fans of using customer personas since we first saw them in use around 10 years ago. For us, customer persona is an essential online branding and conversion tool that helps businesses create more customer-centric, less product or company-centric web experiences. As we talk to marketers when training and consulting, we’re surprised how many companies and their agencies are still not applying this technique. It tends to be a "big business" approach, but we think the approach can and should be used on a more DIY approach in smaller businesses too. To help spread the word, we’ve created our guide to inspire more use of the techniques by showing good practices, examples, what to watch for and where to find out more. The guide has also been bundled with a template so creating your own personas as is easy as filling out each box with the relevant information. Together, they help agencies and consultants improve their use of design personas, and also enable companies to specify their business requirements from personas when using internal or external resources. Who are the guide and template for? Digital marketing managers, who can use the personas generated by the template to help create a marketing plan. E-commerce marketers, who want to structure their attempts to boost conversion rate by more effectively targeting given segments. Small business owners or startup marketers, who needs to define the customer personas for their business. Agencies or consultants, who need to create or review the customer personas of their clients. What does the persona guide include? What does the persona template include? 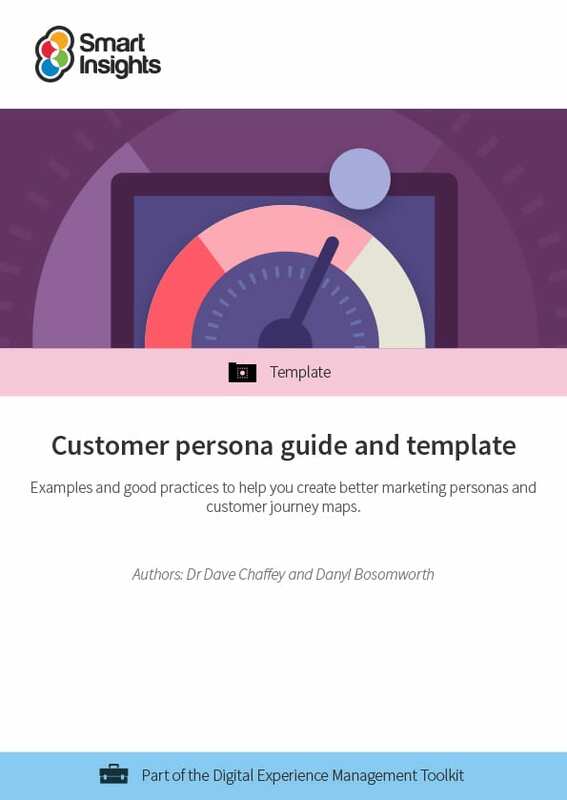 Formally two separate resources, our persona template has now been bundled with the customer persona guide so our members have everything they need in one resource. The guide has been improved with the addition of B2B and B2C customer touchpoint maps for customer journey analysis. The template has been improved with the addition of the B2B Buyer Persona template, with an example included. Format: (Guide) PowerPoint document packed with inspiring examples of personas and persona creation techniques and guidance plus customer journey mapping examples. (Template) Excel file containing examples for both regular and buyer personas to guide your own persona creation. Companion guide: Customer persona research guide – explains research techniques and data sources to help build personas. Dave is co-founder and content director of Smart Insights. He is editor of the 100 templates, ebooks and courses in the digital marketing resource library created by our team of 25+ Digital Marketing experts. 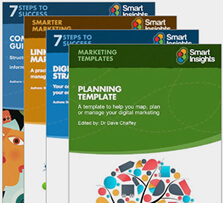 Our resources used by our premium members in more than 80 countries to Map, Plan and Manage their digital marketing. Dan helped to co-found Smart Insights in 2010 and acted as Marketing Director until leaving in November 2014 to focus on his other role as Managing Director of First 10 Digital. His experience spans brand development and digital marketing, with roles both agency and client side for nearly 20 years. Creative, passionate and focussed, his goal is on commercial success whilst increasing brand equity through effective integration and remembering that marketing is about real people. Dan’s interests and recent experience span digital strategy, social media, and eCRM. You can learn more about Dan’s background here on LinkedIn.